Kunafa | Knafeh | Kunefe | Knefe | Kanafeh recipe with step wise pictorial method. Kunafa | Knafeh | Kunefe | Knefe | Kanafeh is a Middle – Eastern (Palestine, Jordan, Syria, Lebanon and Turkey) favourite baked desert, traditionally made during the month of Ramadan, a period of fasting for those of the Islamic faith. Mainly pronounced as Ku-na-fa, this desert is made with a very fine vermicelli-like Phylo pastry, also called shredded Phylo dough, kataifi or knafeh dough. Also a thick syrup of sugar and a few drops of rose water or orange blossom water is poured on it during the final minutes of cooking. Often the top layer of Kunafa is tinted with red food coloring & different nuts of one’s choice are sprinkled on top as a garnish. Along with many names, Knafeh comes in number of forms, textures, presentations and fillings. The texture of the Kunafa also varies from fine (knafe naameh) to rough (knafeh khesneh), brominated kunafa & perplexing Knafeh. In different variations of this dish, the cream is replaced by mozzarella or by cream cheese or cottage cheese and at times cinnamon is added. The exact ingredients differ depending on which region it comes from. We are presenting the recipe of Kunafa with little variations depending upon the availability of ingredients. 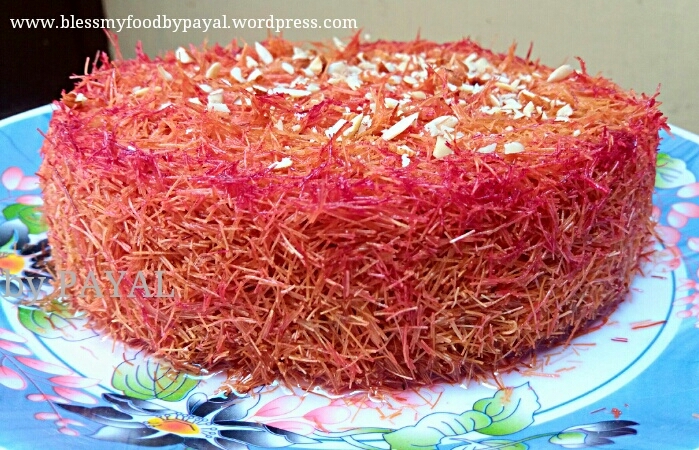 As already said, this type of Kunafa is made with a very fine vermicelli-like Phylo pastry, also called shredded Phylo dough, kataif or knafeh dough. But this dough is not available in our city, so we are using very thin vermicelli. The filling of it is made with a cream prepared from milk. The second thing we tried with our recipe is an attempt to curtail the calories to the maximum we could do. The traditional kunafa is made with too much of butter/ghee and sugar, hence highly rich in calories. Just imagine that where we are mentioning 2-3 tsp of butter/ghee, traditional kunafa demands about 1 cup of butter/ghee. So we have tried our best to curtail the calories wherever it was possible to do without affecting the traditional taste of kunafa. 1. Take 1/2 cup of milk out of 2 cups in a bowl & add corn flour. Mix well & keep aside. 2. Take a pan & add remaining 1.5 cup milk, butter, vanilla essence and sugar. 4. When the milk begins to boil, add corn flour mixture and keep stirring. 5. When the milk coats the back of a spoon, and a straight line made by your finger stays clear, then it is done. 6. Remove from the heat. Let the cream come to room temperature. You can keep the cream if going to make kunafa after a gap of few hours. 1. Place a pan filled with water & sugar on a gas stove. 2. When it begins to boil, reduce the flame to medium and let it boil for 10 minutes*****. 3. Switch off the flame, add lemon juice & rose essence. Mix well & keep aside. 1. Preheat the oven on 200°C. If using microwave, preheat it on convention mode on the same temperature. 2. Chop the nuts & keep ready ahead. 3. Take a small bowl & mix about 2 tbsp of melted butter & red food colour. Also better to chop nuts & keep ready ahead. 4. Grease the baking pan (mine is 6 inches round) with this red coloured butter. Keep aside. 5. Take 2/3 of vermicelli in a bowl & crush gently. 6. 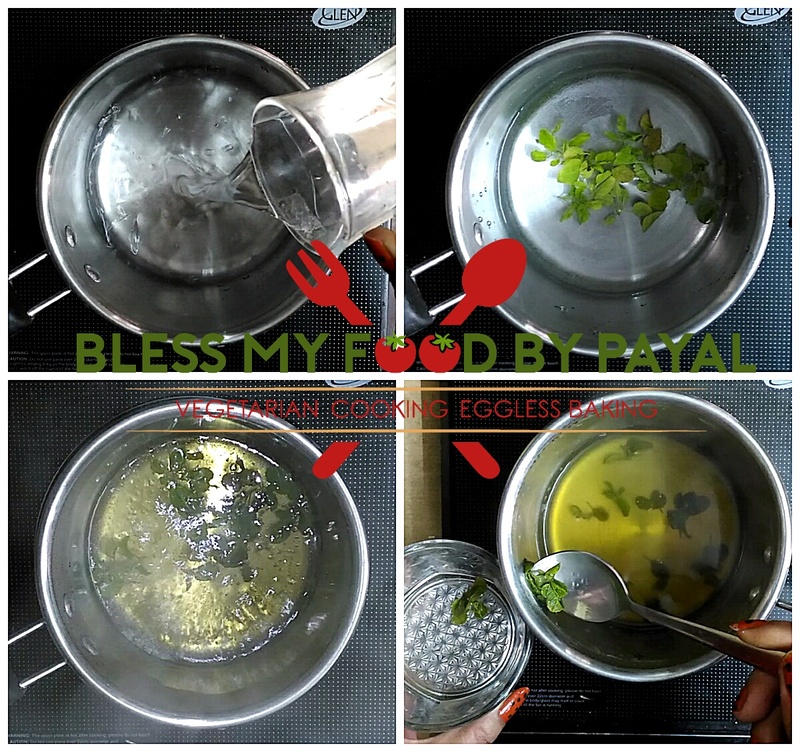 Pour 2-3 (or as per need) tbsp of milk & 1 tsp (or as per need) softened butter to bring moisture to the vermicelli. Don’t add much milk otherwise vermicelli will become soggy. 7. Mix all preferably with hands so that the entire batch of vermicelli is coated thoroughly and become little moistened. But don’t over do. 8. Now take a greased baking pan, spread the vermicelli & firmly press it on the bottom and up sides. 9. Make a wall with the vermicelli around the sides of the pan so that the cream will remain confined to the vermicelli & will not flow out during the baking process. 10. Pack the vermicelli as tightly as possible with the help of potato masher. You can also use the bottom of a cup/katori to pack it tightly. 11. Mix half of the nuts in the cream & pour in the cream filling and spread with a spatula into an even layer. 12. Take the rest of the vermicelli & moisten it like you have done earlier in para 6 under the running head. 13. Scatter this vermicelli over the cream filling & lightly press it. 14. Transfer the pan to the oven and bake for 20 to 25****** minutes, or until the top of the vermicelli turns brown in color. 15. Remove the kunafa from the oven and immediately pour on the sugar syrup, starting from the edge and moving towards the center, in a circular motion, making sure to cover the entire surface. 16. You can also reserve some syrup for drizzling over individual servings if desired. 17. Let the kunafa rest for 15 minutes to allow for the syrup to soak in, then invert on to a serving platter. 18. Garnish with rest of the nuts. Cut into wedges and serve. Kunafa is usually served warm but me & my family liked it chilled. However you can make it ahead of time and keep it in the fridge. Simply take it out and serve it with a drizzle of syrup on the arrival of your guests. It stays good in refrigerator for a couple of days. * Instead of cream filling you can opt other alternatives too. 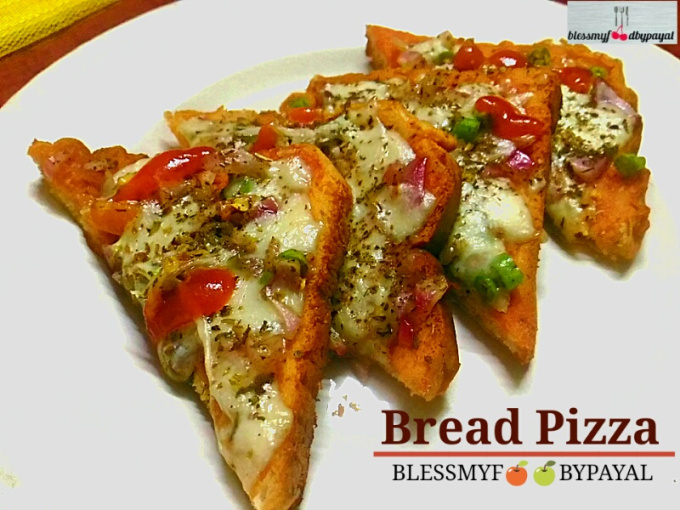 Like make the filling with crumbled Paneer/cottage Cheese and Mozzarella Cheese. Can also add Rabri or condensed milk/milkmaid. **The traditional kunafa is always drizzled with sugar syrup. However some people love to cherish kunafa with the drizzling of condensed milk/milkmaid. ***The traditional kunafa is made with Kataifi dough. 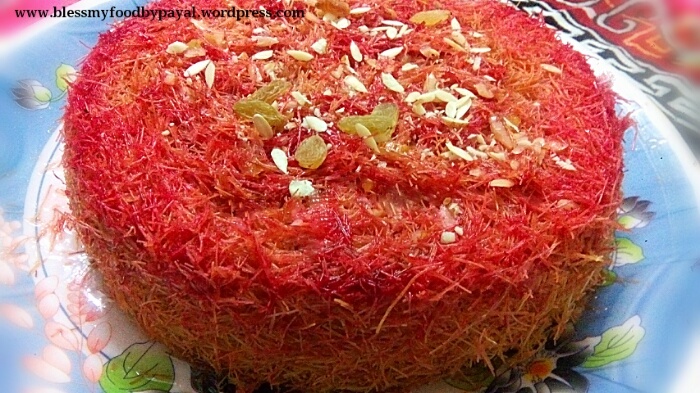 Kataifi dough is nothing but the vermicelli like shredded phyllo dough. As kataifi dough is not available in our city, so we have made kunafa with vermicelli. ****We have used roasted vermicelli. You can use even unroasted one but in that case, baking time will be little extra. *****Don’t allow to simmers sugar syrup beyond 10 minutes. Better set the timer, otherwise it could thicken too much and become candy-like and not pourable. Also keep in mind whether you are using roasted or unroasted vermicelli because unroasted needs extra time of baking, as we have already mentioned. Interesting to read vermicelli as one of the ingredients. But, it looks amazing. Thank you so much. Just loved the way you appreciated my efforts. Thank you once again.